A nostalgic seaside town on the Netherlands’ west coast is starting to shape up with the arrival of Vesper, the area’s first boutique property. Located amongst a string of typical B&B’s on Noordwijk Boulevard, the new property is housed in the former Hotel Clarenwijk, originally built in 1904. 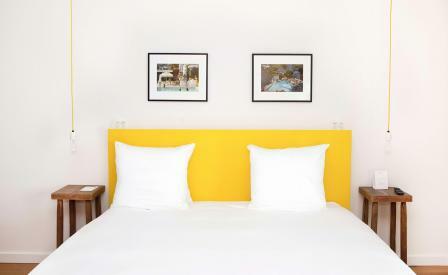 Owners and brothers Michiel and Martijn van den Berg tasked Paris-based architect Bart Akkerhuis and interior designers Miriam Irle and Philipp Molter to transform the building into a welcoming space comprising 27 bright guest rooms, fitted with vintage design furniture. Highlights include an original 1920s stained glass ceiling in the lobby, while the Grand Vesper Suite comes complete with its own terrace, private sauna and steam room with uninterrupted views of the North Sea and beyond.